We are a dental office that focuses on dental and overall wellness. Most of our team is female so bringing awareness to breast cancer and screening is in line with our beliefs. We’ve all had a family member, friend and countless unbelievable patients fight the breast cancer battle. We are happy to help in any way we can. Where might we find you with this pink wig on? You will find us sporting these wigs at our dental office out and about. 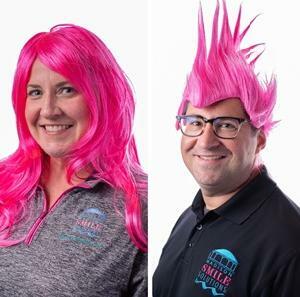 When you check in for your same day crown or adult orthodontics we will be sporting the pink wig! You might even catch a glimpse of us at a local happy hour or soccer game. We will be hard to miss. What will be your competitive edge against your competitors in the Big Wigs?What goes great with pink hair …White teeth and big smiles. We like to see people smile so we will be enjoying this PINKTASTIC fundraiser! To see all the BigWigs click here. Since 1999, Komen Wisconsin has invested over $18 million in the local community. This past year alone, vital services have been provided to women and men, including 2,684 screenings, 2,810 receiving support services, 1,671 diagnostic services and education to 25,805 people. Komen Wisconsin has also invested over $6 million in national breast cancer research. Together with sister affiliates across the country, Susan G. Komen is investing more than $33 million this year to fund 86 research project; 44 percent of these are focused on metastatic research to understand and ultimately prevent the breast cancer that kills.